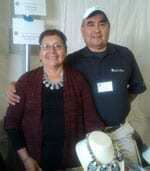 Mary Tafoya creates innovative designs in mosaic which sets her apart from most other Santo Domingo pueblo artists. 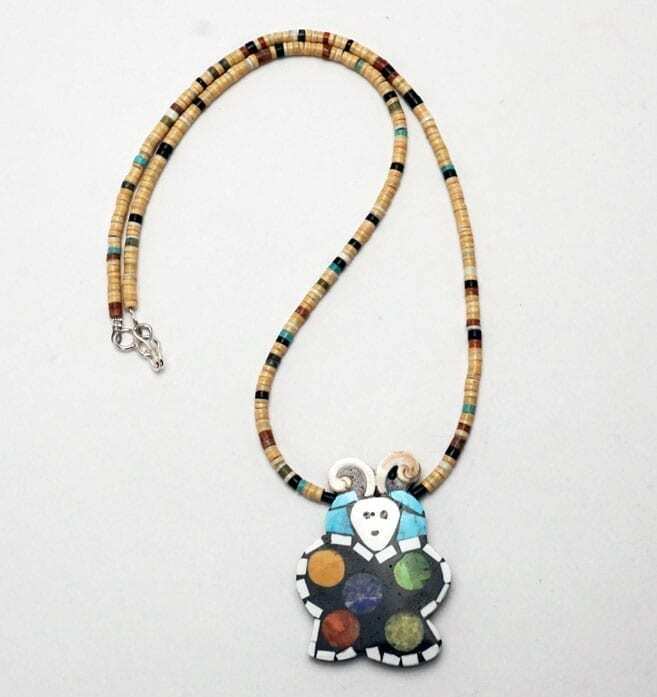 This charming, colorful design is similar to the butterfly trademark Ms. Tafoya engraves on the back of her necklaces. See Mary Tafoya’s work here. Artist’s statement: “Growing up in a traditional family in Santo Domingo Pueblo, the last thing on my mind was that my art would allow me to travel to a great part of the United States, much less have my jewelry designs in demand at galleries and art shows! I have employed skills acquired helping my parents stringing, designing traditional Santo Domingo jewelry. Remember the old style Thunderbird necklaces inlaid on batttery casings or records, being sold along highways or on the plaza in Santa Fe? Those are the inspiration for my art. 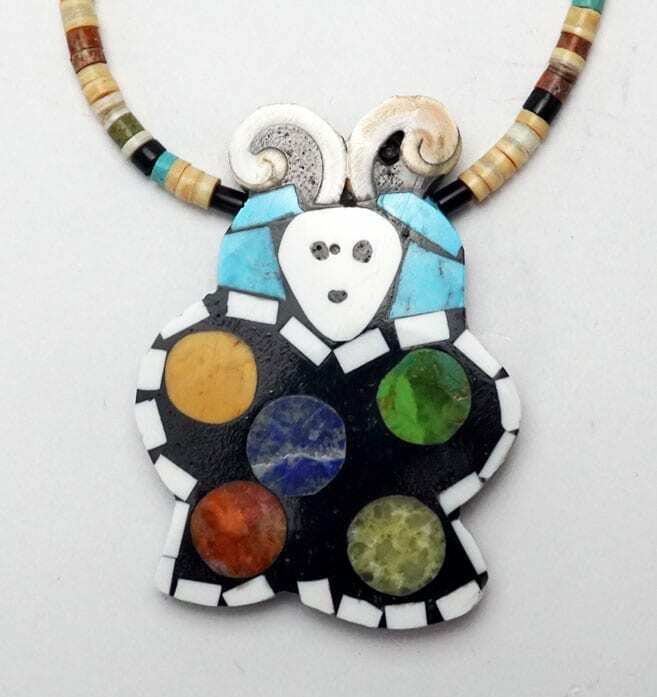 My jewelry has evolved from traditional Santo Domingo turquoise “heishi” and “Depression Era” work to a modern, contemporary, mosaic, multi-colored inlay jewelry, that is versatile for formal and casual wear. Using natural stones, shells, and turquoise, my designs are free-form inlay where no two pieces of inlay are alike, as each stone or shell is cut to fit a design right out of my memory. I try to find different types and colors of stones, unusual shapes of shell, cutting them at different angles to get the desired look. Lately, I had used silver filings to create a “glitter” effect to many pieces Sometimes I do not know what each piece will look like until is finished. My pieces have fooled many of my customers and even seasoned art collectors into asking “How dis you paint these designs?” When told that these are the natural colors of my material and how they are intricately inlaid, they are amazed by the detail in my work. 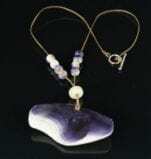 The patience required by my parents when I helped with the family jewelry production has helped me with numerous design ideas. 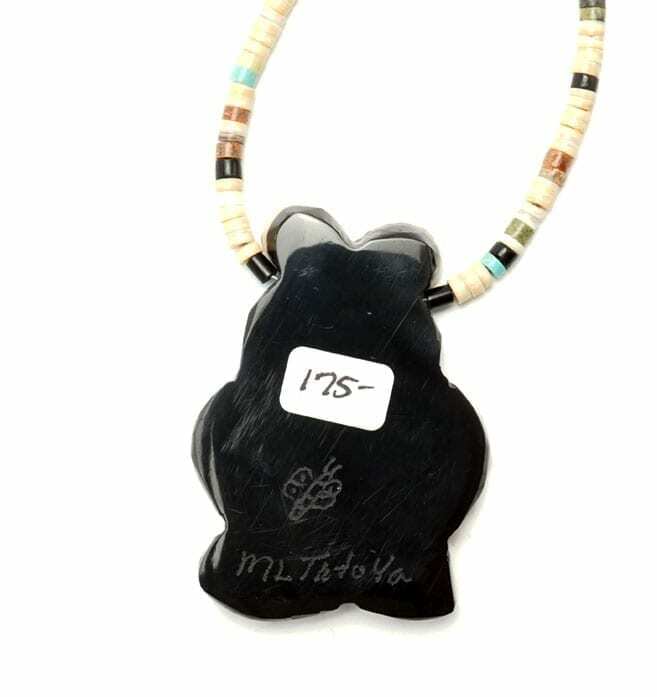 We at Home & Away Gallery consider ourselves to be extremely fortunate to have come across Mary Tafoya’s inlay necklaces, earrings, and pins. While we admire many Santo Domingo artists, Tafoya’s sense of color and design are very painterly, and are distinct from all other Santo Domingo work we have seen. We are honored to carry her work. Amelia Joe-Chandler combines traditional cultural elements with a contemporary sense of design. She does not use any polish on her silver; as a result, the matte finish of her work is very distinctive and the artist's hand is evident in every piece. 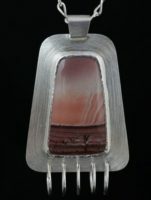 Sterling silver pendant with a spectacular picture jasper cabochon from Deming, New Mexico. 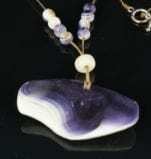 This is one of a series of pendants by Joe-Chandler with stone from this area. The cabochons display a phenomenal desert landscape and sky. 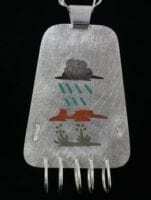 This pendant depicts female rain over a mesa in sandstone inlay on the reverse side, with yucca plant in the foreground. This inlay reflects the scene in the cabochon as well. 1 7/8" h x 1 3/8" w; 19" chain Each of Amelia Joe-Chandler's pieces comes with an illustrated card that describes the materials and the story depicted.